For a limited time we have our Clark's Graduate Special!This bundle includes a beautiful floral bouquet decorated in a mason jar, a teddy bear and a balloon! 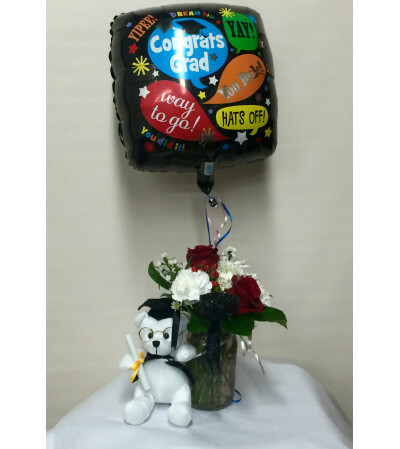 What a perfect way to say "Congratulations" to that special graduate in your life! This is an amazing deal! While supplies last, subject to substitutions based on availability. I gave Clark's House of Flowers an order for my daughter's Bridal Shower with a somewhat unique request. I asked that they create centerpieces in kitchen colanders (which I provided). They came through with flying colors. The centerpieces were a hit, especially with the Bride-to-Be! Thanks so much. 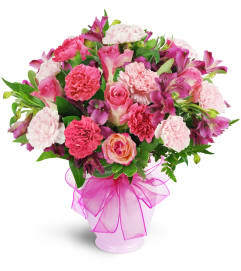 Clark's House of Flowers is a Lovingly Florist in Staten Island. Buying local matters. Discover how Lovingly supports local florists. Copyrighted images herein are used with permission by Clark's House of Flowers.